Lamps Plus has partnered with top NFL Draft prospect Forrest Lamp. 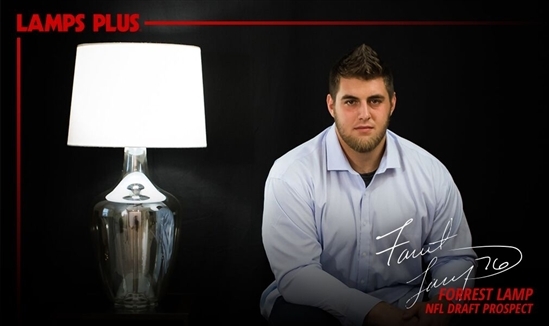 Lamps Plus Inc., the nation’s largest specialty lighting retailer, is adding a new Lamp — Forrest Lamp, a highly-touted NFL Draft prospect. Lamps Plus today announced a partnership with Forrest Lamp ahead of the 2017 NFL Draft this weekend in Philadelphia. An Associated Press third-team All-America and first-team All-CUSA selection, Lamp completed a successful college football career at Western Kentucky University where he was a four-year starter on the offensive line from 2013-2016. A two-year team captain, Lamp competed in 51 career games for the Hilltoppers. One of the Draft’s top-rated offensive linemen, Lamp is known for his overall athleticism, quick feet and hand speed. A leading multichannel lighting and home furnishings retailer, Lamps Plus maintains partnerships with interior designers throughout the United States for residential, commercial and hospitality properties. The endorsement agreement with Forrest Lamp is the company’s first with a future professional athlete as the company continues to expand its customer base. Lamps Plus will be furnishing the future new home of Forrest Lamp and longtime girlfriend Natosha Boden when the couple settles into their new NFL city.